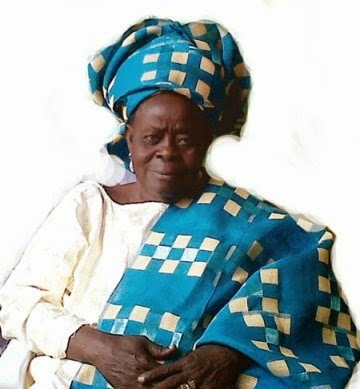 80 year-old Sarah Adeyinka was born on August 30, 1934 in Ifo Local Government, Abeokuta, Ogun State. In a recent interview with Punch, she revealed that despite her old age she still remembered everything that happened on her wedding day. Mrs Adeyinka strolled down memory lane on how she met and married her husband after falling in love with him, and how they rekindled their wedding vows on her 80th birthday. He was charming and good looking. I liked his physique. So many men had approached me, seeking my hand in marriage but I wasn’t attracted to them. My husband caught my attention the first day I saw him. Till today, I love him; my love for him hasn’t changed. I still remember our wedding day, it was a beautiful day; we danced until we had no more strength left in us. We were so happy and I can never forget that day. I have a sweet marriage and I still love my husband till today. The only issue I have is his weakness for women. He ended up marrying three more wives after me. When I realised that I couldn’t handle his having other women in the house, I moved out to be on my own. I’m someone that doesn’t like stress; I prefer staying on my own so I can enjoy peace. Yes, we are still husband and wife but we live separately. I live in my house here in Lagos while he lives in his house in Sagamu, Ogun State with his younger wife. He came for my 80th birthday. We rekindled our love for each other that day. How do you mean when you said rekindled your love for each other? It is not something every woman wishes for; I accepted it as my fate. My father also had more than one wife, so I see it as a weakness that is common among men. At 80, how do you keep yourself busy? My children set up a shop for me where I sell various food items. This keeps me busy. I don’t like sitting at home from morning to night doing nothing and being idle; I’m used to being busy. Yes, I exercise. I enjoy talking long walks. That is the only type of exercise I enjoy and I’ve made it my exercise routine. I take long walks every Tuesday. I enjoy eating amala with ewedu and gbegiri. I also enjoy semolina and pounded yam. I like singing and dancing. Church is my favourite place to be because of the praise and worship songs. My favourite song is Oluwa se mi lore o, (The lord has done me a great favour). When I’m singing and dancing, I’m always full of joy. Life is too short to worry over issues one can’t change. What has kept you strong till date? I love efo (vegetables) that is well-prepared, I eat that regularly. I think that is what keeps me strong. Vegetable is good for the body. Eating ewedu too nourishes the body. I don’t joke with fruits, I eat one fruit daily. How many more years do you hope to live? I don’t have a particular number in mind; all I pray for is to have a good life. I pray not to be a burden to my children, I also pray against encountering any form of problem that would stress me. I want to continue to live my life in peace until God says it is time for me to come home. Naija men will never change. Na wa.